Joshua Liberles – Writing, Editing & Marketing: Excited by a Water Bottle? Better Believe It! Water bottles aren't typically the most exciting bike accessory. They serve a crucial function (lugging your liquids), but “exciting?” Not so much. The director of my road team came across BioGreen Bottles at Interbike, the bicycle industry's tradeshow. I subsequently contacted the company to demo some of their bottles to see what all of the hub-bub was about. The bottles come in a variety of shapes and sizes and look pretty much identical to the industry's benchmark standard: the Specialized Big Mouth. BioGreen and Specialized share a nice, wide screw-top that allows for easy cleaning and plenty of room to add scoops of drink mix. The style, form, function, and price of the two offerings are all very similar. So, what's the big deal? BioBatch. The bottles will last just as long as a traditional bottle. But, when disposed of at the end of its life-cycle, nutrient-rich humus and methane gas are the sole remaining components. Although methane can be a greenhouse gas, it can also be harnessed for power production in intelligently setup landfills. The company manufacturers their bottles right here in the U.S. - Santa Fe Springs, California. Most of the bottles contain 20% recycled content, but they're experimenting with a 90% recycled bottle currently available in black (I tried one of these – function was identical to the other offerings). According to Bielemeyer, the #4 plastic used in these bottles is easy to recycle, often via curbside pickup. Recycling is still a better alternative to throwing the bottle away but, inevitably, some will end up in the trash. It's nice to know that, unlike the vast majority of our plastic world, any traces of these used-up bottles will soon vanish. As you can imagine, water bottles are just the beginning for BioBatch. As consumers become more eco-savvy, plastics have taken on an increasingly bad rap. 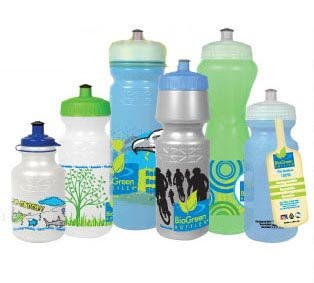 Reducing the use of plastic of any type is a plus for the planet, but some items – bike water bottles being a prime example – work best when made from a reusable plastic. Look for more BioBatch products to hit the shelves soon. So, yeah... I'm excited by these water bottles – and really glad that my team will be working with BioGreen for 2009 and supporting their cause. 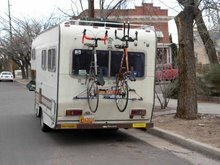 I was so excited when this was posted on Cycloclub yesterday. How cool! I've forwarded it to all my bike friends.